I was trying to incorporate Frankie into an activity during one of our "stay home days" (the weekend). 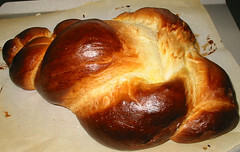 I thought a Challah would be a nice way to incorporate the fun of rolling out play-doh, braiding and painting. She seemed to have fun and actually helped quite a bit. I love this loaf, and it's good when it gets stale (if it lasts that long) for French toast (one of Frankie's favorites). 1. Warm/melt the first three ingredients on the stove and allow to cool to ca. 100F. 2. Dump everything but the glaze into a bread machine and put on dough cycle. 3. After the first rise, separate the blob into 3 portions, round each portion and let rest covered with a towel for 10 minutes or so. 4. Roll out each portion so it looks like a snake with an undigested mouse in it; fat in the middle and thin on the ends - this will give the bullbous shape in the middle of the final braided loaf. The ropes should be about 14 inches each. This was an especially fun part for Frankie. 5. Braid the ropes together and place the braided loaf on top of a piece of parchment on a cookie sheet. Cover the loaf with a towel for about 10-20 minutes - don't overproof. 6. Paint the loaf with the glaze mixture. 7. Bake at 425 for about 30 minutes. It'll be pretty dark because of the honey but shouldn't burn. 8. Allow to completely cool before cutting in. Looks like a fun way to involve the kids! Yeah, this is a pretty dry dough and it's fun to play with. The only problem is my daughter kept eating bits of the raw dough while rolling.